he film, starring Andy Garcia and Eva Longoria, tells the story of Mexico's Cristero War of the 1920s, which was centered around religious freedom. The film was beautifully shot across historic locations in Mexico and also features prominent Hispanic stars Karyme Lozano, Ruben Blades and Eduardo Verastegui. For Greater Glory , which will be coming to DVD and Blu-ray on Sept. 11th. The film, starring Andy Garcia and Eva Longoria, tells the story of Mexico's Cristero War of the 1920s, which was centered around religious freedom. The film was beautifully shot across historic locations in Mexico and also features prominent Hispanic stars Karyme Lozano, Ruben Blades and Eduardo Verastegui. What price would you pay for freedom? 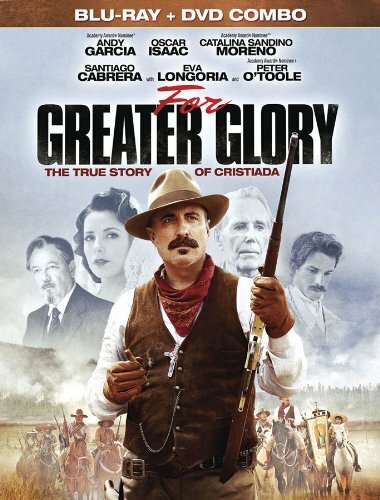 In the exhilarating action epic For Greater Glory an impassioned group of men and women each make the decision to risk it all for family, faith and the very future of their country, as the film's adventure unfolds against the long-hidden, true story of the 1920s Cristero War the daring people's revolt that rocked 20th Century North America. Academy Award(R) nominee Andy Garcia headlines an acclaimed cast as General Gorostieta, the retired military man who at first thinks he has nothing personal at stake as he and his wife (Golden Globe nominee Eva Longoria) watch Mexico fall into a violent civil war. Yet the man who hesitates in joining the cause will soon become the resistance's most inspiring and self-sacrificing leader, as he begins to see the cost of religious persecution on his countrymen . . . and transforms a rag-tag band of rebels into a heroic force to be reckoned with. The General faces impossible odds against a powerful and ruthless government. Yet is those he meets on the journey youthful idealists, feisty renegades and, most of all, one remarkable teenager named Jose who reveal to him how courage and belief are forged even when justice seems lost.